The Incredibles, Gender, and America: the Affects of Democracy? The enduring popularity of superheroes in the United States raises all sorts of interesting questions. What exactly is being lauded in these supers and what does this lauding say about democracy, individual will, freedom, and other idealized values of our nation? I have been privy to a number of conversations around these questions on account of the smart research being done by Adam D. J. Brett, a graduate student in my department at Syracuse who is mentored by my colleague and dear friend, Zachary Braiterman. This blog post on The Incredibles and The Incredibles II will not likely touch on Brett’s concerns, but if it does I assume he’ll tell me! Two facets of the Incredibles films strike me at once. First, the turn away from the state in order to attend to the microdynamics of family; and second, the affective fluidity between the impossible desire to “get it right” in the family and the impossible desire to inaugurate substantive community (Gemeinschaft) in civil society. As any reader of Hegel knows, de-emphasizing the state is a historical interruption of the assumption that the family exists as the ethical core of the state. In both Incredibles, the family absolutely stands as an ethical core, but not for the state. As represented by government officials of various, vaguely-presented sorts, the state is not the sublation of family and civil society but appears as a weak vessel for the will of the people, poised to wither away into obscurity. The ethical impetus of the two films stays with the family for the sake of a utopian desire for authentic community (as my former student Holly White might say). To reach this impetus, the films labor first to figure out what exactly makes and secures a family (particularly the economic role of men as laboring “to provide for the family” in The Incredibles) and second to figure out the question of parenting–or, put less generously, to tarry with the social contradictions that typically glue childcare to women–in Incredibles II. The unexplained premise of both films is that Supers are humans who just happen to possess unasked-for, physics-defying capacities. [I have often wondered whether the choice of the protagonists’ last name, Paar, is an attempt to underline Supers’ passivity with respect to their powers. “On par” with everyone else, they possess at birth whatever the genetic process has doled out, without any “super” intervention.] The use of their unearned specialness to intervene in social catastrophes is either outright resented, as is clear in the first Incredibles through Syndrome’s monologues, or found to be simply too chaotic, destructive, and expensive. In an ironic swipe against the order-restoring Supers, the general populace judges them disorderly and cries out to ban them. Lo-and-behold, the state meekly acts on the misguided General Will and bans them. It is hard to feel sympathy for the Supers. Though their “natural being” is cruelly repressed by social opprobrium, they still remain, well, super. The first Incredibles presents this dynamic beautifully and humorously by squeezing the hulking Bob Paar into a tiny cubicle of a heartless insurance company. The images suggest that surely Mr. Incredible himself is a better insurance policy than anything sold by the company! It seems that social repression of the Supers’ powers only hurts society; it doesn’t really hurt the Supers. Far from arcing toward a radical anti-democracy, one might read this message against the grain and conclude that grooming persons fully to be who they are born to be–whatever their inchoate gifts and skills–will more certainly ensure social democracy than any state-enforced policy enacted in response to fear or misunderstanding. The viability of family lies here not in sublating social assimilation to state policy but in undermining the law in order truly to become who you are, that is, in relationships based on love and loyalty and that work to bolster each other in the communal task of protecting your neighbors with the skills and gifts you have. Many viewers supposed the gender inversions of Incredibles II to function as something like “equal time”. But really it’s more like a mirror image, with all the wonkiness that comes into play when you step through the looking glass. Helen Paar’s reincarnation as Elastigirl is the social application of the ethico-relational habits she developed as a stay-at-home mother, but without the feminine submissiveness required of her suburban persona. What habits? Those of close attention, awareness of details, a care for the integrity of space and process, a concern for the needs of the other. Recall that when Helen begs Bob to get more engaged in the family in this first film, Bob yells the desire back at her (“You want me to be more engaged?”) and then lifts the dinner table, careening the children through space. In Incredibles II, this kind of blunt action without regard for bodily context is actually given a neoliberal quantification: Mr. Incredible causes more damage and therefore costs more. If the public is to be cajoled back into favoring Supers, Elastigirl’s ethico-relational approach is a better bet. The benefits of her approach far exceed cost-savings, however. The message here, I think, is not just that men need to up their game and learn to competently perform the household and childcare tasks that have been women’s purview for centuries, but that in learning these tasks they need also to learn a different manner of relating to others: to children, to neighbors, to lovers, to train tracks and tall buildings and anything else that has been materially wrought, brought into the world, and cared for. To sum up by repeating my premise: the desire of The Incredibles and Incredibles II is profoundly democratic, perhaps even isonomic in the manner theorized by Kojin Karatani. The desire is, in short, for an open, caring civil society that soon will not need state machinations to bind it together. The desire is for family structures that cultivate deep attention and deep caring for others, an attention that bolsters each person’s unique skills and gifts, and a care that translates into support, protection and understanding. The desire is for the affects of this kind of family to broaden fluidly into a social context so that we feel ourselves a rule of the people, or an equal norm of the people, even while recognizing that each of us has different, unasked for, proclivities that need nurture, attention, and practice. That the two films focus on Bob Paar is a not-so-subtle indication that this ethico-relational comportment for the collective crafting of social community is hardest for those in dominance: for whites, for the middle classes of sufficient economic stability, and especially for men. One of the phrases that affect theorist Sara Ahmed truly dislikes is the hackneyed plea of parents, “We just want you to be happy.” Though Ahmed’s books are like daily meditations for me (a paragraph a day keeps feminist anger at bay), I have disagreed with her analysis of this cultural cliché since I first read it, and not just (I think) because those hackneyed words have rolled, many times, off my own lips. “Take the phrase ‘a path well-trodden.’ A path can be made by the repetition of ‘being trodden’ upon. We can see the path as a trace of past journeys. When people stop treading, the path might disappear. On the one foot: we walk on the path as it is before us. On the other foot: it is before us as an effect of being walked upon. A paradox of the footprint emerges. A path is created by being followed and is followed by being created. We can use a path insofar as we do use a path. Can here is a consequence of doing. If we can because we do, then we do can rather than can do” (Living a Feminist Life, 45-46). What this passage implies to me, though Ahmed does not stress it, is that a path spools out in front of our feet even as it is our feet that (re)make the path. The heartbreak of the generation gap is the expected but still painful heartbreak of your children veering away from the stories and rituals and principles and assumptions that have–quite materially–formed the spoken and unspoken walkways of family. It is a child’s rejection of the parents, of the past, of the old ways, and it’s ok, it’s expected. But it hurts. Sometimes, the phrase “I just want you to be happy” is a temporal band-aid, a cognitive scramble to bide time while the affects catch up. So much–so much–of being a (white, bourgeois) parent is training one’s bodymind into twenty years of hypervigilance on behalf of your child’s safety, material and emotional needs, and opportunities for the future. Because of this long duration, the hypervigilance becomes an unthought but deeply habitual path. It spools out into the future in ways that far exceed rational capture and yet are deeply felt. And it’s only after your child tells you that their path will be quite different–it literally is only then, when the geography of that path spooling into the future bursts into a million uncharted pieces, that its endearing and calming topography also comes into blinding, retroactive clarity. “I just want you to be happy” is a phrase thrown into that explosion, a phrase that, at least for me, attempts to clear the air of that bursting detritus, to perform a basic trust in my kid’s ability to step where they need to step, and to assert that come what may, I will be here for them. No matter what. My hypervigilance has to ease up and get redirected, but it will never not be the path that I walk. Pixar’s latest short, Bao, screened prior to the new Incredibles II film, touchingly illustrates my reflection on Ahmed’s phenomenology of parental path-walking. The Chinese-American boy is imaged as a little dumpling, a bao who is carefully and tenderly cared for by his competent Chinese mother. She attends to his food, his growth, his play. She establishes rituals with him and protects him from harm. Even so, of course, the boy becomes a teenager and pushes his mom out of his life. The emotional honesty of this short is intense and rare. 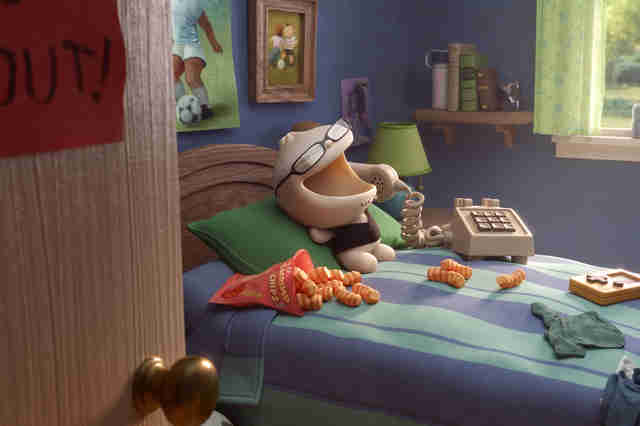 The last shot–which I cannot find online–shows the mom and grown-up child sitting on her bed, sharing buns as they did together when he was young. They sit eating side-by-side, not looking at each other but looking out in front of themselves; tears stream down both of their faces. The healthy and inevitable veering of the next generation into autonomous adulthood is also sad, an irrecuperable loss of a closeness and tenderness that materially and affectively fed both parent and child for many, many years. Adrián Orr’s Niñato (2017) is carved out of the same parental problematic, but in a temporally and affectively different part of the family path-making and path-walking, prior to the children’s break-away to a different orientation. Set in contemporary Madrid, Niñato is shot tightly in claustrophobic sequences that refuse to pan out to establish a room or a full body or even a two-shot of the characters speaking in the scene. The spatial suffocation so closely matches economic suffocation that the one tips easily into the other. A man, his parents, his son, his sister, and her two daughters all live in a small apartment. The man and his sister can’t afford to pay for school lunches, so they walk the children to school, then home for lunch and back to school. To be available for this to-ing and fro-ing, they must work at night. Even this short description enforces too much linear narrative on a 70-minute film that dwells more on the long and futile morning battle of getting three kids up and clothed and out the door and the long and frustrating battle of getting the kids to do their homework than on any traditional story arc. There are rare moments when we see the brother/son/father smoking, snatching kisses with his lover and rapping on stage–and all of these moments are shot in tight, fragmented shots, in dark rooms, and often with the backs of the characters facing the screen. The film oscillates between long sequences of whining kids and little forward motion and these brief, almost stolen, moments of adult work, desire, and relationship. The oscillation cunningly conveys the affects of exhaustion, self-limitation, and open-ended obligation that are endemic to parenting during the precarious labor forces of the twenty-first century.